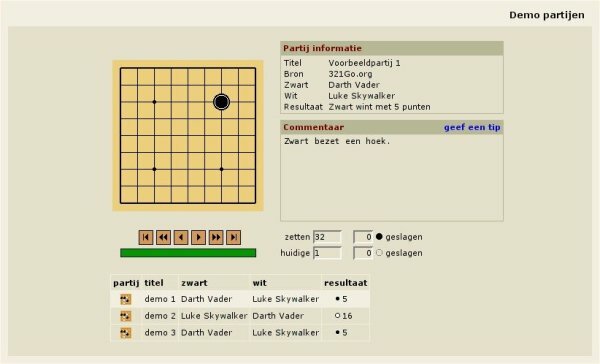 The 321Go game archive currently contains fully analyzed 9x9 games with the aim to show complete Go games to beginners while explaining every move to them, guiding them through the game like a mentor would. In the near future the archive will be extended with a 13x13 collection and possibly with a 19x19 collection. Since all coaching will be done online and IGS-PandaNet has facilities to archive game reviews as SGF files our archive will gradually grow with such lessons provided the pupil has given us permission to publish it.